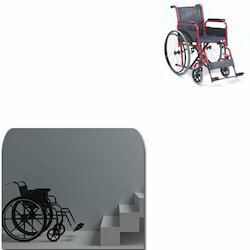 Manufacturer & Supplier of Manual Folding Wheelchair for Stairs. Our product range also comprises of Power Wheelchairs, Hydraulic Lifts and Staircase Lifts. We are one of the well-known manufacturer, supplier, distributor, wholesaler, trader and retailer of Manual Folding Wheelchair for Stairs. The offered manual folding wheelchair is especially designed for transport over the stairs, in hospitals and clinics. Our offered manual folding wheelchair is made from high-grade raw materials and components, which are sourced from very reliable vendors in the market. Looking for Manual Folding Wheelchair for Stairs ?